Lake Tahoe has a community for every lifestyle, and for those who prefer serenity to that of the nightlife scene, North Tahoe is the place to be. The pebbly beaches along the shore are perfect for long walks with the family, and the deepest waters of Lake Tahoe can be found here. With such a wide variety of North Tahoe real estate available, there’s something for everyone. Dollar Point located east of Tahoe City is considered one of the North Shores best neighborhoods. It appeals to both primary and second homeowners. The Dollar Point Association features a beautiful swimming pool, 4 tennis courts, beach, pier and bouy field. Dollar Points central location is close to North Tahoe Nordic ski area and is inbetween Northstar, Squaw Valley and Alpine Meadows ski areas. Prices start at approximately $650,000 to $8,000,000 for a lakefront. Carnelian Bay features two dog friendly beaches, with stunning lakefront properties as well as hidden properties. The views and high-end homes are equally spectacular, including some of the most charming properties in Lake Tahoe. Luxury Carnelian Bay real estate can be start around $350,000, with the most impressive properties reaching $5,000,000+. Agate Bay homes for sale located just east of Carnelian Bay vary from lakefront properties to secluded wooded homes. Some residents enjoy access to the Sun Club and the top-notch facilities available including a swimming pool, tennis courts, pier and buoy field. Prices range from approximately $375,000 to $800,000. Tahoe Vista on the North Shore is a desirable area with a mix of small cabins, luxury lake view estates, some newer homes and custom lakefronts homes. The North Tahoe Regional Park with hiking and biking trails, baseball and soccer fields, a par course, a frisbee course and cross country skiing in the winter is just out the back door. 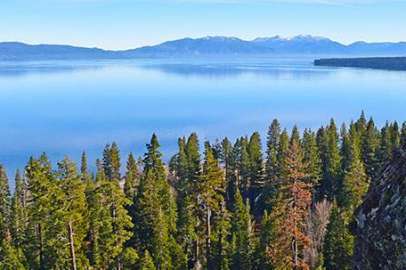 Tahoe Vista home prices range from approximately $350,000 to $4,000,000 plus for lakefronts. Kings Beach, at Lake Tahoe’s northern tip, is known and named for its large sandy beach. Lake views, serene settings, and close proximity to the North Tahoe Event Center are enjoyed by all. Kings Beach homes for sale tend to be more affordable yet unique cabins some of which offer lake views for under $700,000.. Northstar Resort is a short drive away. Tahoe City is a popular spot with rich history and year-round activities. Spend winter on the slopes of Alpine Meadows or Squaw Valley, then relax in summer and tube the Truckee River or walk the Truckee River path. Common Beach in Tahoe City has a playground for kids, excellent lake access and live concerts in the summertime. When you own Tahoe City real estate, you’re close to many fine restaurants, unique shops, and great community events. Prices range from approximately $350,000 to $1,500,000. At Tahoe Park, just south of Tahoe City, enjoys everything from hiking to boating, then dine out at popular area restaurants like Sunnyside Restaurant and Fire Sign Cafe. Tahoe Park homes for sale include access to a wonderful gated park and beach with two piers. Prices range from $425,000 to $1,000,000+. Up higher above Tahoe Park is Talmont, Twin Peaks and Tahoe Woods all of which are close to forest lands and Paige Meadows for hiking, biking and cross country skiing. Homewood, on the West Shore, is reminiscent of “Old Tahoe” with relaxing beaches and quaint shops along Highway 89. Owning Homewood real estate allows for easy access to the nearby Homewood Ski Resort, and both spacious lakefront homes and secluded Tahoe cabins are available mostly in the $400,000 to $1,000,000 range. Meeks Bay, not too far from Emerald Bay and Bliss State Park, has the best views of Rubicon Bay’s turquoise-blue water. Meeks Bay real estate is primarily single family lake view homes and exclusive lakefront estates. Meeks Bay Beach and Marina is a favorite summer hot spot. Tahoma includes smaller communities between Homewood and Meeks Bay, with Tahoma real estate properties ranging from summer cabins to luxury homes. Tahoe Cedars located in Tahoma is more affordable area on the West Shore with prices ranging from $275,000 to $800,000. Grabbing a drink at the Tahoe’s oldest bar, Chambers Landing Bar and Grill, is a must! Start searching for North Tahoe real estate and view the homes for sales in North Lake Tahoe today.